Internationally best-selling author Barbara Eppich Struna is fascinated by history and writes a blog about the unique facts and myths of Cape Cod. Her published books are The Old Cape House and The Old Cape Teapot; her third novel in the Old Cape Series is The Old Cape Hollywood Secret. 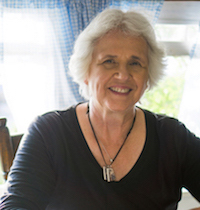 Besides being a storyteller at heart, she is currently president of Cape Cod Writers Center, a Member in Letters of the National League of American Pen Women, International Thriller Writers, a panelist at the International Thriller Writers – Thrillerfest 2016, and a member of Sisters in Crime and two writing groups. I write to music but it has to have no melody, singing, or vocals. Music from movie soundtracks or video games are the best. I am a hybrid writer. I know the beginning, the middle, and the end but do not how the characters move from A to B – that's the fun part. If I'm stuck, I'll talk to my character, then do a mindless task, like showering, or walking by myself. Sometimes I interview my character to find out who they really are, that way I can fine-tune the why and how they act. Write every day. Keep a journal. My first two books were published through a small press with no cost to me. They closed a year ago.I had to become a self publisher in 30 days or the two books would be taken down from all the sales channels. My third book was self-published by me along with the other two books. First I would try to find a small press, then after no luck, consider self pub. Marketing is very difficult on your own. I probably spend 2 hours every day on social media and marketing.